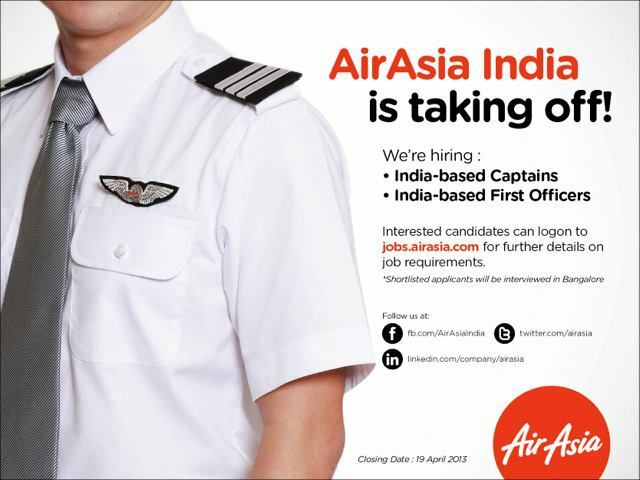 TO EXPRESS YOUR INTEREST IN THE POSITION OF FIRST OFFICER WITH AIRASIA INDIA, PLEASE APPLY ONLY BY CLICKING ON THE "Yes, I'm qualified." BUTTON ONLY IF YOU MEET THE MINIMUM REQUIREMENTS. OUR RECRUITMENT TEAM WILL REVIEW YOUR APPLICATION AND MAKE CONTACT WITH YOU IF THEY NEED TO INTERVIEW YOU. A320 type rating would be advantageous. 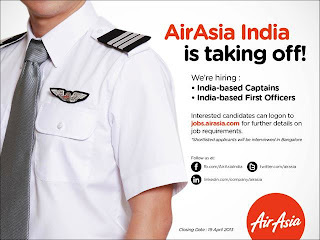 TO EXPRESS YOUR INTEREST IN THE POSITION OF CAPTAIN WITH AIRASIA INDIA, PLEASE APPLY ONLY BY CLICKING ON THE "Yes, I'm qualified." BUTTON ONLY IF YOU MEET THE MINIMUM REQUIREMENTS. OUR RECRUITMENT TEAM WILL REVIEW YOUR APPLICATION AND MAKE CONTACT WITH YOU IF THEY NEED TO INTERVIEW YOU. A minimum of 1,500 hours total P1 flying time on MPA or MPJ/EFIS/FMS above 20,000 kgs and a minimum of 500 hours total flying time on Airbus FBW family.